The finished solid wood and genuine wood veneer cabinet components used in your cabinets are finished with a high quality conversion varnish or a 2K polyurethane designed to withstand the hard wear of continuous usage for many years. The finishing materials are specially formulated to meet the most stringent industry performance standards for resistance to moisture, food stains, fruit acids, alcohol, grease, soap, and detergents. This finish protects the wood and enhances it’s natural beauty. The following are guidelines and recommendations to keep your cabinets beautiful. Regular exterior cleaning requires only wiping with a damp cloth and then drying. Remove oil, grease, or general soil using a clean cloth dampened with a fresh solution of mild soap and water. Rinse with a clean, damp cloth then dry thoroughly. Never use soap pads, steel wool, or cleaners that contain bleach, ammonia, or abrasives. These agents may cause discoloration, marring, or dulling of the finish. Do not wax cabinet surfaces. Wax build-up will leave a residue that is difficult to remove. Polishes containing silicone should not be used. Products such as Murphy’s Oil Soap contain no wax, petroleum, or silicone. Do not use harsh detergents, strong soap, abrasive cleaners, or self-polishing waxes. All of these items can remove the cabinets’ factory-applied finish. 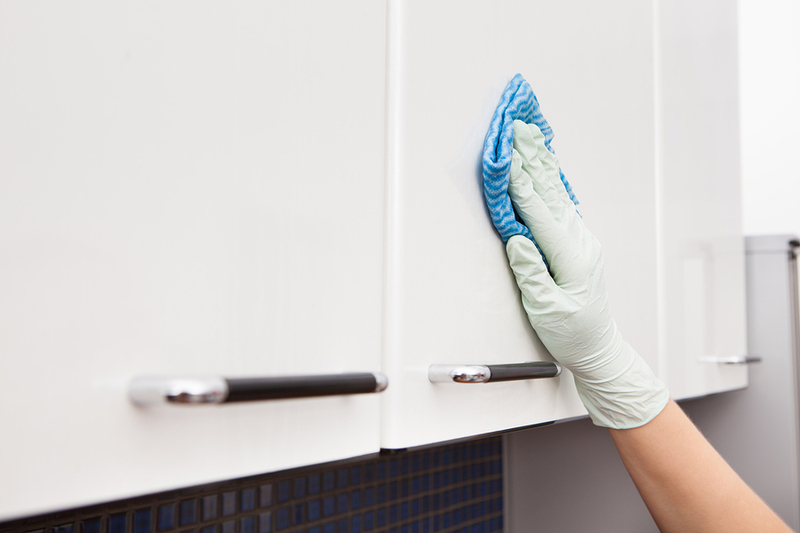 Do not use a dishcloth/ sponge to clean or dry cabinet exteriors. They may contain remnants of detergents and grease from your sink. Treat your cabinets as you would fine furniture and they will reward you with long-lasting beauty. Excess moisture is an enemy of any finish. Sink, range, dishwasher, oven, and baseboard areas are the most susceptible. Immediately dry surface where water may have spilled using a clean cloth. Avoid draping damp cloths or dishtowels over the cabinet doors. Over a period of time this moisture could cause permanent damage to your cabinet finish. Routine cleaning will help prevent long term damage from smoke and grease which can form a hard film over time, dulling the finish of your cabinets. When possible, keep cabinets out of direct sunlight or close curtains during the sunniest part of the day. Direct sunlight will cause cabinets to lighten or darken over time.